Happy and relieved were we to spy Vernazza. Relieved that we had almost arrived, hungry and thirsty after a hard hike. Happy to glimpse this simply stunning little place sticking into the sea on a rocky spit. Vernazza is as perfect as it gets. I would have climbed (almost) any amount of steep stone steps for this sight. The best views have got to be from the trail – seeing it from on high for the first time is something special. 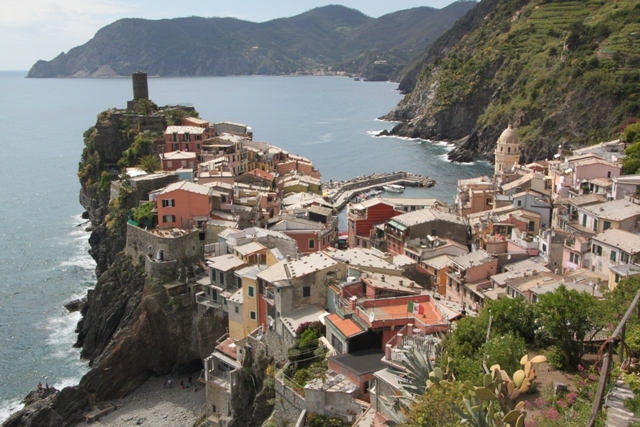 The town is dominated by a castle and has the only natural port in the Cinque Terre. Passing a stack of love locks we made our way into the centre, cooled off with some delicious gelato and caught our breath sitting on the pavement. 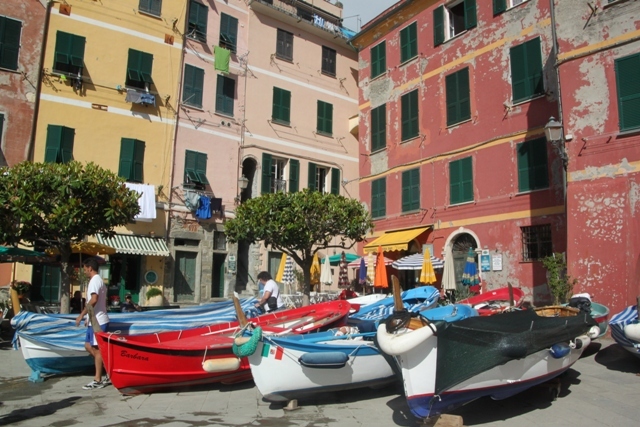 Lots of classic tall, thin houses, cobbled streets and colour everywhere in Vernazza – a feast for the eyes. 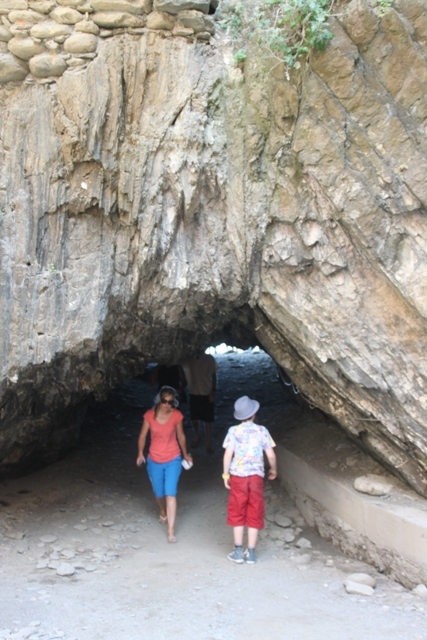 We walked through a huge cave-like rock to get to a pebbly beach. The sea was hammering onto the shore, no chance of a dip here but it was mesmerizing. 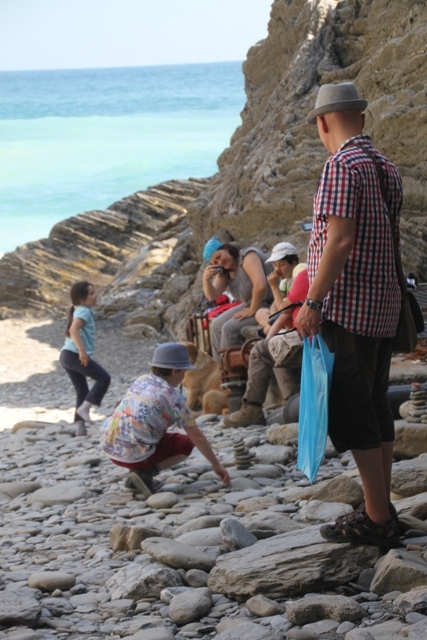 Lack of sand was not an issue – Son was happy to skim stones and design elaborate stone constructions. Back through the cave and in the picturesque square by the harbour we watched fishermen dragging boats in from the water. 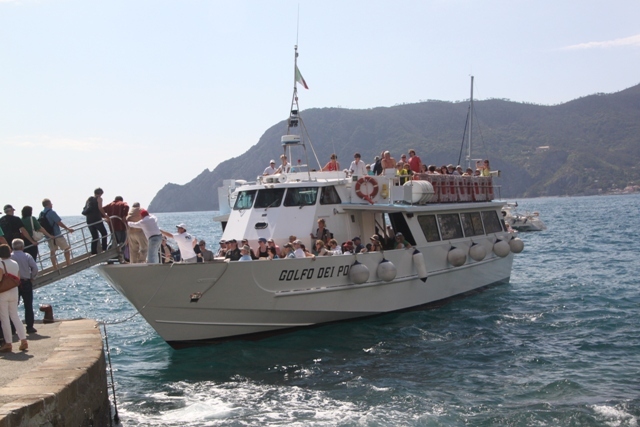 Passengers were boarding the Cinque Terre ferry – this was mesmerizing too as it swayed alarmingly from side to side. Getting up the gang plank was an Olympic feat in itself. The three of us decided instantly this method of transport would not be for us – a lousy sailor on the calmest sea, Son agreed he would rather hike ten more trails than be tossed around on this sea – admiring the views from terra firma, the best way for us. We sat for ages in a bar by the harbour, sipping icy wine, looking out to sea and watching the comings and goings. 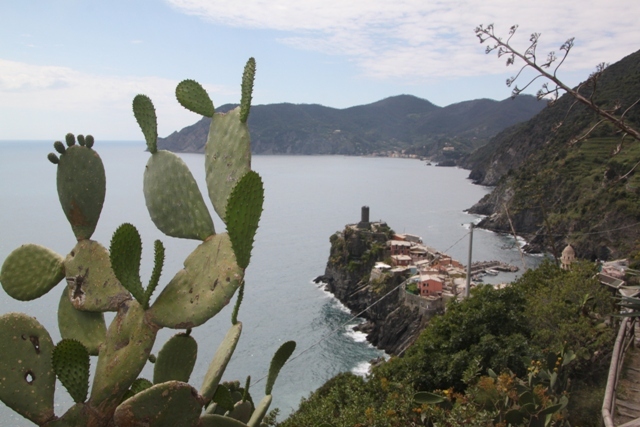 Perfect views in an idyllic spot – Vernazza is bliss. What a magical place! I didn’t know such a town existed! 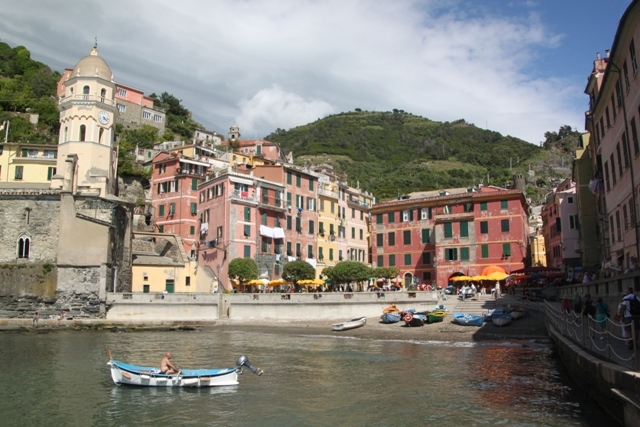 It is definitely magical – the whole Cinque Terre is wonderful, amazing views and a great atmosphere. I didn’t know too much about it before our trip, now I can’t rave about it enough!! Beautiful images. I loved Vernazza. 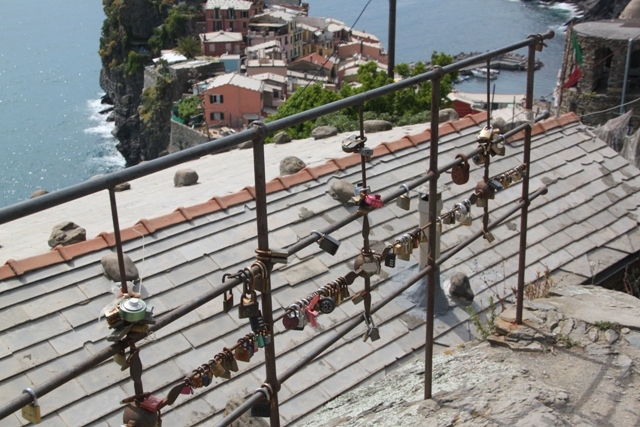 Thank you – we did too – can’t decide whether this or Riomaggiore were my favourites! Wonderfully picturesque. It sounds like this was a brilliant holiday from start to finish. It was one of those really special places – somewhere I didn’t know so much about before this trip, certainly not somewhere I have been yearning to visit for a long time, but it was so incredibly beautiful and special – one of our best holidays in a long time. 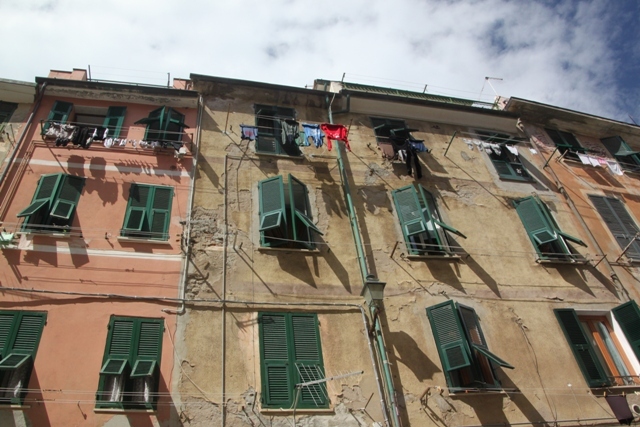 I’m a little curious to see our Cinque Terre accommodation as well. We will arrive next week – definitely the place I am expecting the least from! Will see how it stacks up but we had the same problems with the type of availability we needed – and that was in April. Fingers crossed it will be fine! Seems like a real lottery here with accommodation and luck plays a big part! Even if it’s not perfect though the scenery is and I’m sure you will love it. I can’t stress enough how wonderful the Cinque Terre is – views like you can really only dream of and we all loved it there. Great post. What an adventure! The hiking sounds a bit adventurous for our taste, but the descriptions certainly make it tempting….the ferry description reminds Kate of the ferries in Greece years ago. It’s a great place even if you really don’t fancy hiking at all – you can go from village to village by train or the ferry (but that seemed a bit adventurous for us with those rough seas!). Never been island hopping in Greece (unfortunately) – sounds like the ferries might have been a bit choppy on your trip? Actually, the ferries were not bad but the seas were not exactly placid either. FYI — I saw that Buzzfeed is also singing the praises of Cinq Tierres…. Thanks for the great insight about this destination! My husband I hiked through all five villages on our stay. Craziest, hardest, most beautiful hike of our lives. I loved Vernazza! You did way better than us – much impressed, we only got to hike the last part of the trail because of the landslides but that was bad enough!! Vernazza and Riomaggiore were my favourites but we just loved the whole place. Thanks for dropping by. Just when you think you’ve seen the most beautiful one another one crops up!! Thanks for reading. I have been here, it is beautiful. Totally agree! One of the most beautiful places I’ve been. 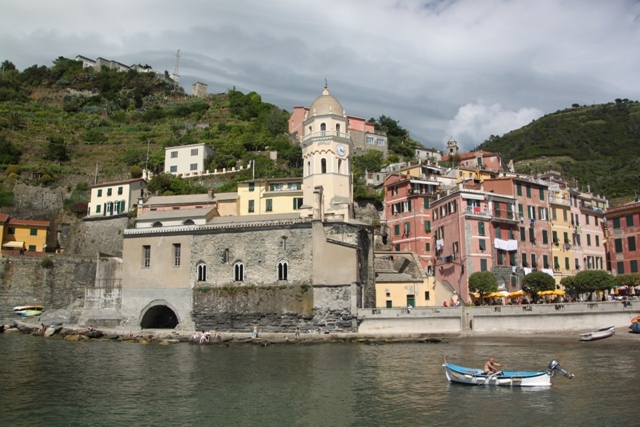 I’m enjoying all your posts about the Cinque Terra, a favorite region of American travel guide Rick Steves. It’s rising to the top of my list. Thanks for the great photos and writeup! It’s a stunning place to visit we loved it! 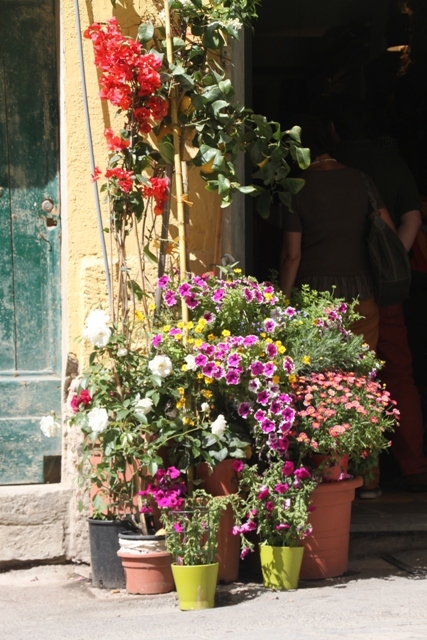 Most people there seemed to have Rick Steves guide books – so he is doing a good job!! Vernazza is so pretty – we only managed a short hike once off the train for a pit stop, still got the views though! Does the town have a lively atmosphere? 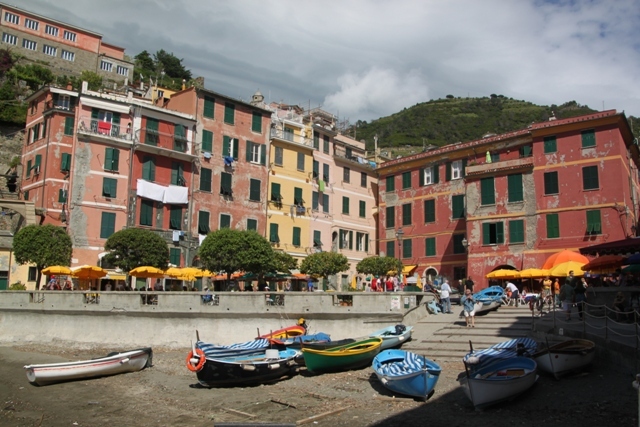 We stayed in Riomaggiore – it was pretty but felt devoid of atmosphere/life. But we rushed the whole area sadly! We spent an afternoon in Vernazza and it was quite lively, especially by the harbour. Not sure how it would be later on though, but definitely more lively than Riomaggiore I thought. The sights were fantastic but don’t get me started on the wine! Made sure to sample plenty and let me just say it is superb!! It is glorious – should be on that list for sure! 😀 I hope to go soon! It is such a stunning place, impossible to take a bad picture!! We loved it – I think that comes across!! 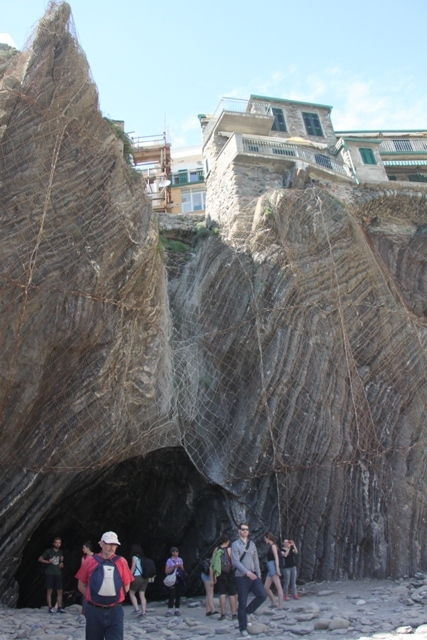 We spent a week in Cinque Terra a few years back! It’s still high on my list of favorite places. Glad you are enjoying it, too! Loved it there – would definitely agree it is now on my favourites list too!! I totally agree with how beautiful it is. You have made this town come to life with words. Thanks for sharing! It’s almost unbelievably beautiful! Thanks for dropping by here. The place looks stunning, very beautiful. Lovely pictures. I’ve never heard of this place, Italy has such wonders. So true, Italy is such an amazing country with wonderful scenery, but this is something else! That tunnel was a big hit with us – quite the way to enter a beach. Not the perfect beach – no swimming or sand, but a beach and after a hike like we’d had our son was too grateful not to be walking to moan about these things. The houses are amazing, but our youngest family member was probably with yours on that too!! It is such a beautiful place I think no matter how much time you have, you could always spend more there! Thanks for dropping by Anna.